Holy Moly! What a weekend! I’m aching all over but I am busy typing up a summary of the awesome Minerva Crafts meet up event, ready for you later this week. Now for something quite different. This is the Berthe shirt from Republique du Chiffon. 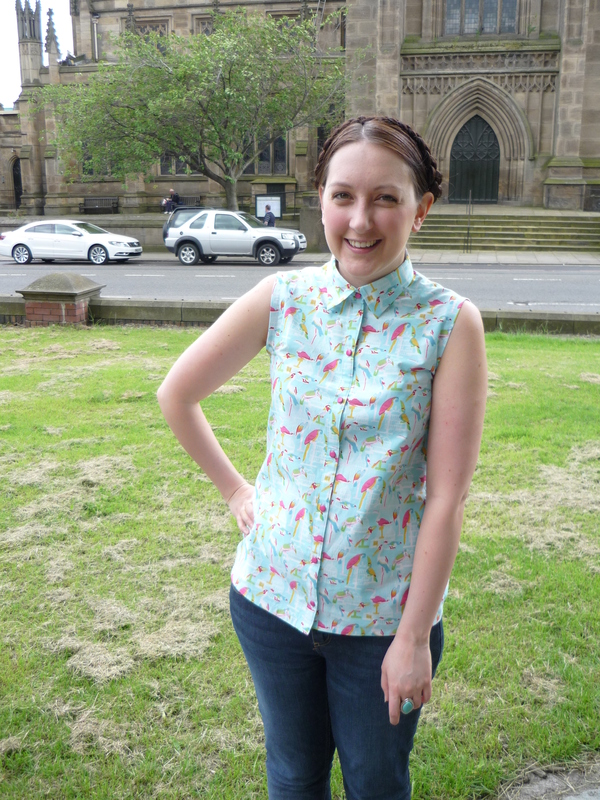 It’s my third version of the shirt but my first blogged one. 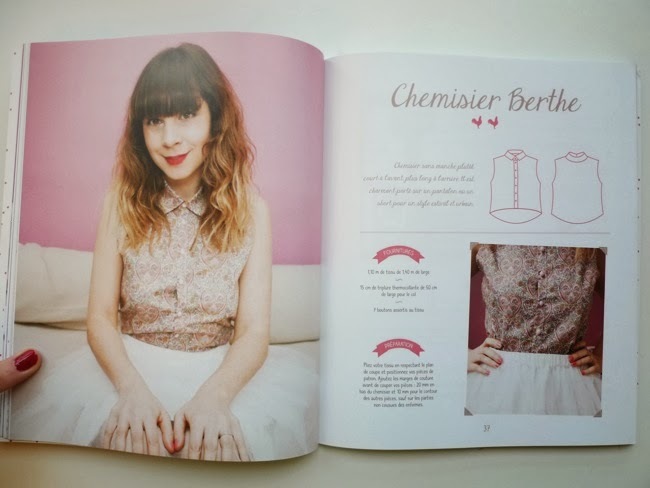 Here are three favourites from other bloggers: Blousette Coquette, Nette, and last but not least Jolies Bobines. 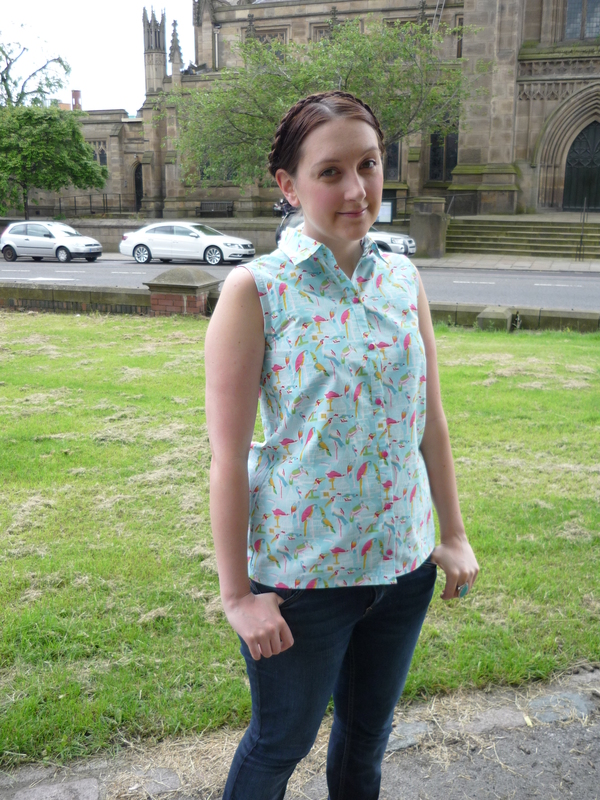 This pattern is from the book Un été couture and is a boxy sleeveless collared shirt with hi-low hem. I’ve almost nailed the fit now. Just those pesky armholes are still a little tight. I’ve left off the hi-low hem in all my versions. 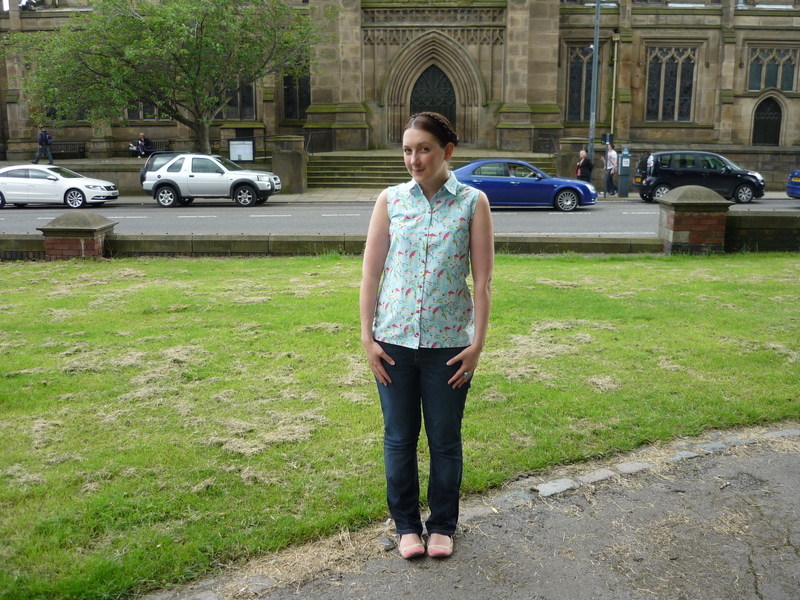 I used an awesome cotton lawn from Ebay (sold out now but Marie found another colourway in her local fabric shop). I’m not sure if you’ll recognise the print? It’s used on Modcloth’s Tropic the Charts Dress. It’s probably a bit pale for me, but it made me smile! The body of the shirt does look a bit better in viscose (which my first two versions were made in) but I love how good my collar turned out thanks to the cotton. The Prym point turner I got from John Lewis was an amazing help to getting a crisp point and a nice round corner on my stand. It’s amazing how you can make do with a chopstick for years and suddenly a bit of carefully shaped plastic can make your sewing so much nicer and stress free!! So why the ugly pelicans. 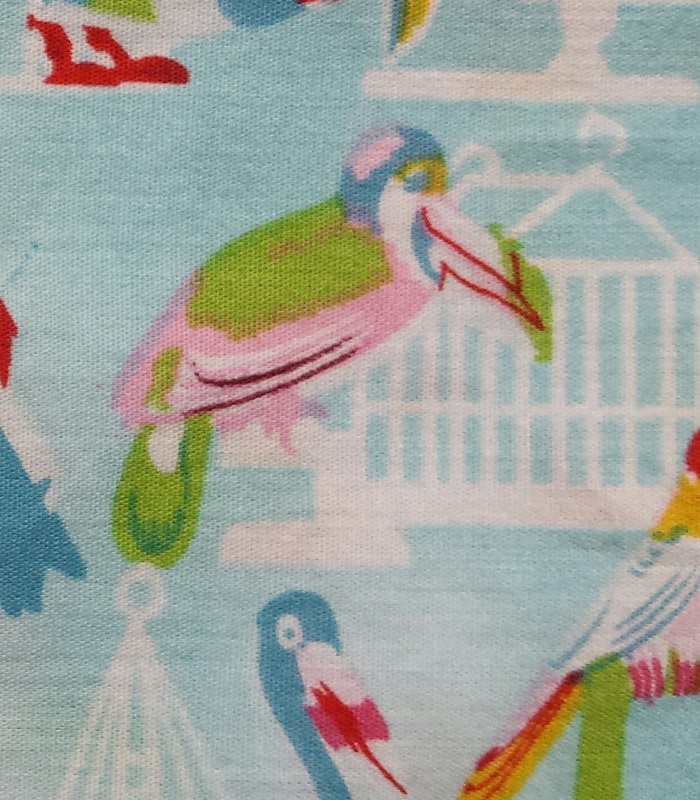 This fabric has awesome birds BUT in the midst of them there is one ugly as sin pelican. 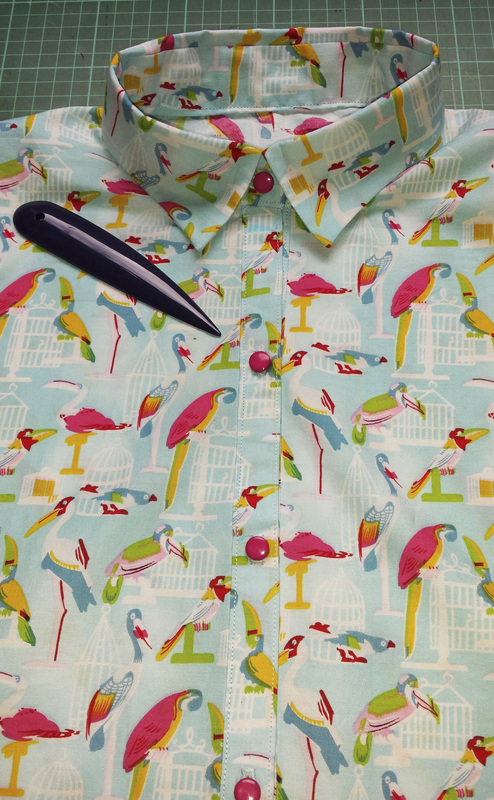 Anyway… Along with my beautifully neat collar, this shirt has some of my best topstitching work. 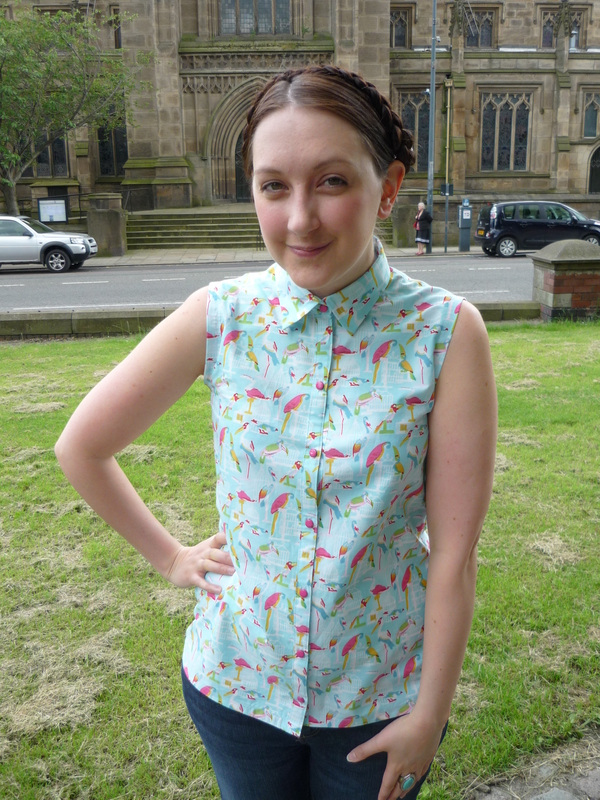 It also has hot pink bias binding around the armholes and hem, plus hot pink buttons which both match the lovely pink parrots. All this makes me very happy. PS. I’m fairly certain this will be the first and last time you’ll see me in braids hahaha. In awe of your super sharp collar, I’ve been using a pair of embroidery scissors for over 20 years after my sewing teacher showed me for my GCSE project! A worthy investment to order in this week. Thanks for the share lady! Aw, cute! You’ve got a really good finish on that collar, the point turner is obviously the way to go. Totally agree about the scary pelican. Birds! I love birds. Even ugly ones! This is a lovely shirt. Please blog your others so we can see! Love the birdies! Even poor pelican. So bright and colourful. One thing I really miss about long hair is being able to do braids like these. Ooh another pelican fan. Maybe he’s not so bad. I gave the braids a go but I’m not sure they’re for me. Got to try new things though! Oh Amy that is so cute!!!! Wow! Such neat work. I can only aspire to something as good as this. That shirt is lovely! It really suits you. Thank you! Haha he IS such a brute, love it. Oh I remember that Africa episode – horrid! But your shirt is def not! Really like it, and you don’t need to worry about the colour, it suits you. Plus love the hair – very Heidi! ps can’t wait to see your MC post – the photos of your dress look bloody amazing on Instagram! Oh my days, I love this pattern. Ugly birds win every time. You look great in it! Looks lovely – and I like the braids! That pelican looks like a crazy Tucan! Great fabric…and your braids are really cute! I love this, the print, the shape that fab collar. I agree with the others we need to see your other two versions. Go crazy birds. Despite the scary bird, this print is great! Lovely shirt. I’ve now added a point turner to my wish list, as well as the book! Wowee! I love the fabric (not that the pelican though – he is scary!) and the style is really lovely on you! And, wow, those points on your collar are SHARP! Amazing!